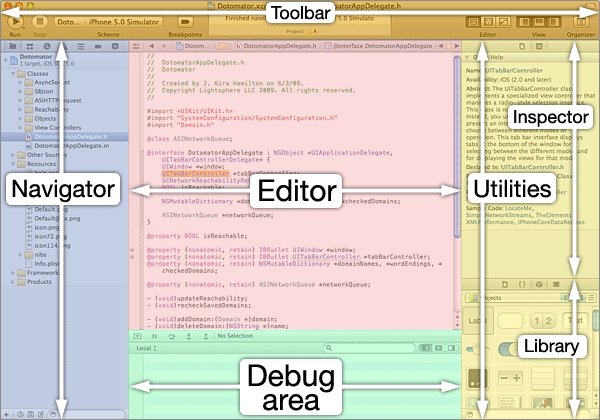 Xcode4 has a single-window, single-application system for designing, coding, and submitting apps. Although you can still open individual files in separate windows, the overall project is organized and managed through this one window. The Toolbar at the top has buttons for building/running your app, and for managing the window. The Navigator (left side) is where you'll select individual files for editing. The Editor (center) is where you'll edit code (or interfaces). You can also view logs in this area. The Debug Area displays logs while the app is running. The Utilities Area (right side) contains additional info about the current file or object. When you're editing an interface file (xib), the Utilities area contains the inspector panel (for configuring interface elements) and object library. There's also a separate window, the Organizer, where you can manage your test devices and provisioning profiles, view documentation, and validate and submit apps to the app store. Use the toolbar to run your app or select a Scheme (which controls whether the app runs in the simulator or on the device; this is also where you'll create a Release scheme for building your app for the App Store). Use the buttons on the right side of the toolbar to show/hide the various window frames in Xcode. Use these for selecting files/logs and searching your project. If you double-click on a file in the navigator, it will (by default) open in a new editor window, although you can change this by editing Xcode -> Preferences -> General and changing the "Double Click Navigation" option. Note that you can change any of the default keyboard shortcuts by going to Xcode -> Preferences -> Key Bindings and customizing the shortcuts there. Line numbers: you can adjust the setting to show or hide line numbers in the editor under the Xcode menu -> Preferences -> Text Editing. Other editing options can be set here too, including the page width, autocompletion, text encoding and more. Shows detailed information about the file - file name, path, image sizes, etc. Shows the class name for the selected UI item. This is where you can set options like background colors/images, visibility, labels for buttons and text fonts, etc. Here you can view or change the dimensions and position of a UI element on screen. View or set connections to IBActions, delegates, bindings, etc. Note 2: If you use LittleSnapper for screenshots, you'll find that it uses these same keyboard shortcuts. You'll either need to quit LittleSnapper or change your key bindings to access the Utilities area with key-shortcuts.